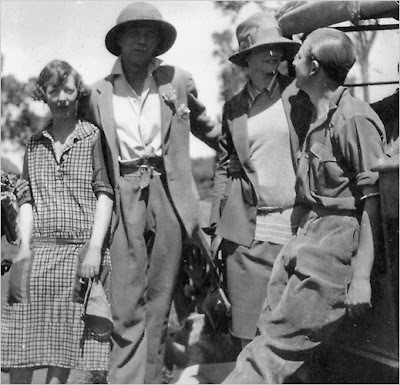 When we were last in Happy Valley, we learned that Alice de Janzé most probably killed her lover, Joss Erroll (Josslyn Victor Hay, 22nd Earl of Erroll). But what about Joss' wife or ex-wife? Yes, she too, has a bio out (we will talk about it later). 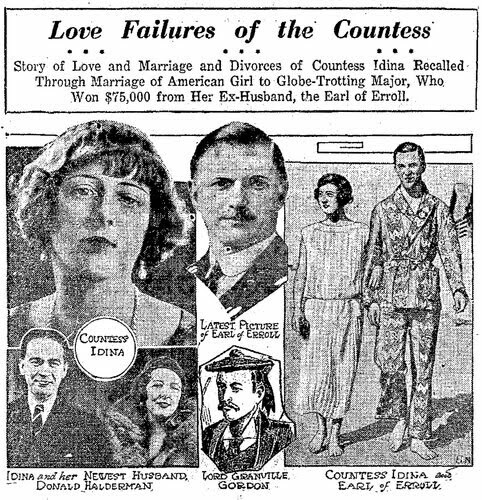 In the above photo you will find, starting at the far left, none other than today's featured bio subject Idina Sackville (looking a bit frumpy in that housedress). Next to her you will find Raymond de Trafford (who, we know from yesterday, was shot because he wouldn't marry Alice de Janzé). Next to de Trafford is the shooter, Alice de Janzé (who eventually became de Trafford's wife and ex-wife). Next to Alice is Joss Erroll who was married to Idina and probably killed by Alice. This may finally prove, beyond a reasonable doubt, that Happy Valley was just a big old trailer park. In fact, no one in the family ever even mentioned Idina, so when her great-granddaughter, Frances Osborne, started sifting through family info, one can only imagine her surprise. 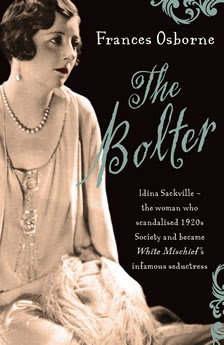 Idina Sackville was according to her great-granddaughter, the inspiration for Nancy Mitford's character the Bolter, the heroine Michael Arlen's The Green Hat, a William Orpen subject, and Molyneux's muse. Idina was always bolting, leaving her two sons and numerous husbands (four or five depending upon who's counting). Even the papers couldn't keep the story straight judging from this newspaper clipping featuring three of her husbands. Again, if you like the 1920's and the debauched colonialism of the Happy Valley, here's another one to add to the list. While her great-grandmother, The Bolter, was scandalizing Edwardian society, Frances Osbourne's other great-grandmother, Lilla Eckford, fought China. At age of 100, she won. Want to know more? Check out Lilla's Feast at Cookbook Of The Day. This sounds great, all so real and true to life. Will have to read more.